Junior middleweight Demtrius Andrade this past Saturday ran his record to 23-0 with 16 knockouts by decking Willie Nelson four times, eventually stopping Nelson in the 12th round at Turning Stone Resort & Casino in Verona, N.Y.
A few days before the fight, Andrade was asked to talk about Muhammad Ali. By the time Andrade was done, it was easy to determine what he thought of Ali, who died June 3 at age 74. “Muhammad Ali certainly shook the world, and not only in boxing,” Andrade said. “He was colorful; nobody talked like him. He helped boxers, too. Ali is the reason Floyd (Mayweather, Jr.) is who he is because Ali set the bar high. Andrade, 28, is from Providence, R.I. He is a former WBO champion who was stripped of his belt for inactivity. The subject of Tuesday night’s “The Fight Game” with Jim Lampley on HBO will center on the late Muhammad Ali, who died June 3 at age 74. George Foreman, who was knocked in the eighth round by Ali in October 1974 in Zaire, Africa, will recall a conversation he had with Ali some four years after they fought. From that point on, the two were amigos. Ali fought Norton three times. They tangled twice in 1973 with Norton winning the first fight by split-decision and Ali winning the second by split-decision. Ali was scored the narrow unanimous-decision winner in their rubber match in 1976, but many observers thought Norton deserved the victory in that one. Tuesday’s telecast begins at 8 p.m. (Pacific time). Heavyweight contender Dominic Breazeale of Alhambra is only 30, so he was too young to see Muhammad Ali fight. But that didn’t stop Breazeale from knowing a lot about Ali, who died June 3 and was laid to rest Friday in his native Louisville, Ky.
Breazeale (17-0, 15 KOs) spoke about Ali during a workout Tuesday in Ontario. 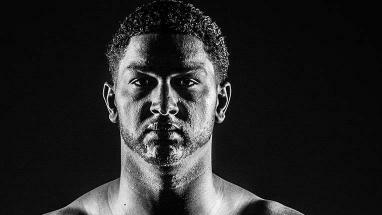 “Muhammad Ali was a huge inspiration,” said Breazeale, who will challenge Anthony Joshua (16-0, 16 KOs) of England for his world title June 25 at O2 Arena in London (on Showtime). “Heavy hearts when great ones pass away like that. He was a wonderful man. I never had the opportunity to meet him, but I did meet some of his kids, Layla Ali being one of them. A special episode of HBO’s “The Fight Game” with host Jim Lampley will air Tuesday night and the subject will be the late Muhammad Ali, who died this past Friday at age 74. The episode will center on Ali’s impact on sports, culture and politics. Headlining the list of guests will be actor Jack Nicholson, who had a long friendship with Ali. Boxing fans around the world are waiting to see if Muhammad Ali can win his latest fight with his deteriorating health. Ali on Thursday was hospitalized in Phoenix with respiratory issues. By Friday, there were several reports that Ali had been placed on life support. Others speculated the seriousness of this latest hospital stay is being overblown. Ali, 74, has been suffering for decades from Parkinson’s disease, which apparently exacerbates his breathing problems. Ali, one of the greatest fighters in history, went 56-5 with 37 knockouts while fighting from 1960-81. Former heavyweight champion Leon Spinks is in a Las Vegas hospital after a second operation for abdominal issues, the Associated Press reported Monday morning. According to the story, Spinks had his second surgery over the past few days after experiencing complications from a first emergency surgery. His wife, Brenda Spinks, spoke to the Associated Press. Spinks, 61, is from St. Louis. He shocked the boxing world when, in February 1978, he won a split-decision over Muhammad Ali to win two of the heavyweight world titles. It was just Spinks’ eighth professional fight. Spinks went 26-17-3 with 14 knockouts fighting from 1977-95. Today, Feb. 25, is the 50th anniversary of the world heavyweight title fight between Sonny Liston and Cassius Clay at Convention Center in Miami. Liston, the champion at the time, quit before the seventh round of a close fight, citing a shoulder injury. Clay was credited with a sixth-round TKO. At the time, Liston was ahead by two points on one scorecard, Clay was ahead by two on another and the third scorecard was even. There is speculation that fight might have been rigged, according to files released by the FBI, though Clay – who afterward changed his name to Muhammad Ali – was not suspected of being part of the fix. Check out this story in today’s Washington Times detailing the events surrounding what then was considered quite an upset. Note the story in this link mentions Liston quit before the eighth round. It was actually the seventh. 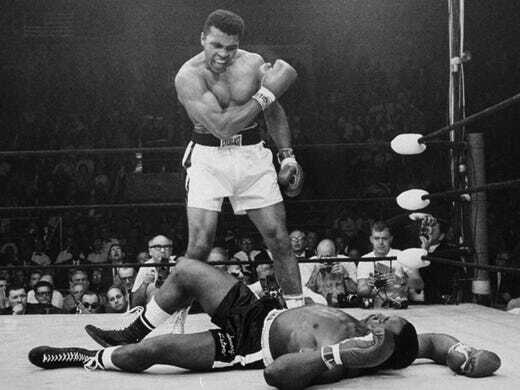 The two fought a rematch on May 25, 1965, Ali knocking out Liston in the first round with what was described as the “phantom punch.” Rumors began immediately, suggesting Liston took a dive. Longtime promoter Bob Arum on Saturday will promote the welterweight fight between Manny Pacquiao and Brandon Rios in Macao, China (on HBO pay-per-view). During a conference call, he remembered vividly his favorite international promotion, and it was no surprise. Ali won when Frazier did not answer the bell for the 15th round of the fight that took place Oct. 1, 1975. “These guys went at it and (trainer) Eddie Futch wouldn’t let Joe Frazier come out for the 15th round and Muhammad won the fight,” Arum said. Arum also remember the immediate aftermath. Several outlets are reporting that former heavyweight champion Ken Norton has died at the age of 70. Norton had been in poor health since suffering a stroke in 2012. He was perhaps best known for his three fights with Muhummad Ali, of which only one was for a major championship. Norton broke Ali’s jaw in their first fight in San Diego, won by Norton via split-decision in March 1973. Six months later, that September, Ali won a split-decision over Norton at the Forum. Ali was scored the winner over Norton in their third fight in September 1976 at Yankee Stadium. It was a controversial unanimous decision, one that enabled Ali to retain his two major title belts. In one newspaper account the day after that third fight, Norton was quoted as saying he told Ali to his face he thought the decision was a poor one. Norton was asked what Ali’s reply was. “What could he say? He knew I was right,” Norton said.